For her birthday all Fran wanted was one of my cakes. For the woman who starts counting the days until pitchers and catchers report from the last out of the World Series (114 days) I thought a baseball themed cake would be perfect. I mulled it over for a while, discarding baseballs, gloves and bats before deciding on a baseball park. As I often do, I searched Google images for ideas of a design for a baseball park cake. Not finding any that caught my eye or attention, I designed my own. The first thing I discovered is it is very difficult to make a small cake with any detail. I compromised and used M&M’s for fans and Peanut M&M’s for players. The scoreboard is a Hershey bar (one of Fran’s favs) with a Happy Birthday message piped with royal icing. You can tell I did that, the piping is mediocre and the penmanship is atrocious. 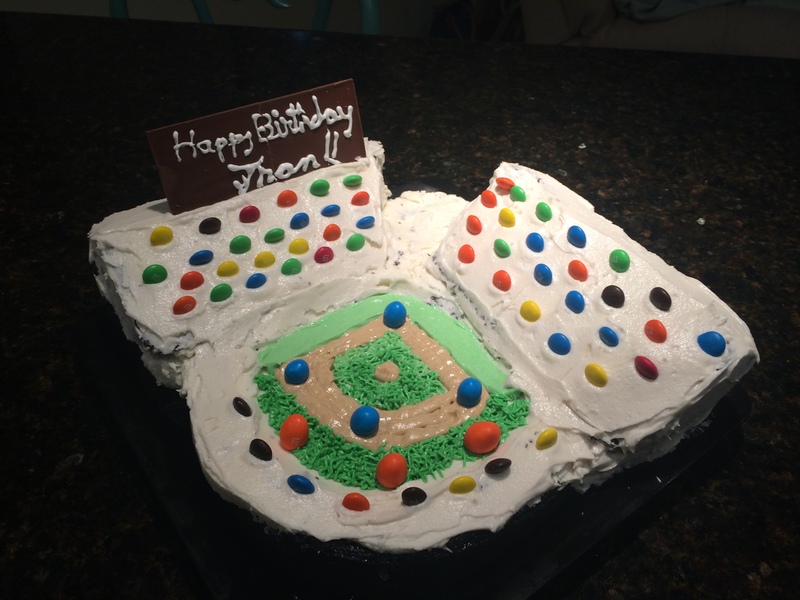 The playing field is chocolate cake with the outfield carved into a curved radius and grand stands are white velvet cake baked in a bread loaf pan then cut at an angle to make parallel triangular wedges for the grand stands. Everything was crumb coated with white butter cream frosting, chilled overnight and a finish frosting coat added the next day. The infield was made from green dyed butter cream and piped onto the cake with a grass tip (Wilton #233.) M&M’s were placed strategically around the ball park and the scoreboard on top of the right field grand stand. Recipes for all cakes, frostings and icings can be found in other posts in my blog.